Advice on skincare is something that I get asked for a lot. More so than haircare, fragrance or makeup – although I answer my fair share of those queries too! – and I believe the reason is that skincare, though it’s come a long way in recent decades, is still something of a mystery to so many. Products are constantly changing in line with new technology, trends state that you should have just 2 steps in your routine, and then 5, and then back down to 3 – and that’s before you factor your skin’s own changeability into the fray. The muchness of it all means that the more personal ‘this worked for me’ effect is so important. DHC is one of those brands for me. I had heard about it lot before we launched it at Escentual, though not through adverts or editorial spreads. It was pure word of mouth! Huge in its native Japan and in the US, DHC create premium beauty products rooted in the beneficial properties of olive oil, with influences from both Eastern and Western culture. You don’t formulate high tech skincare for over 30 years without chalking up an iconic product or two, and DHC has produced some stellar staples in its time. 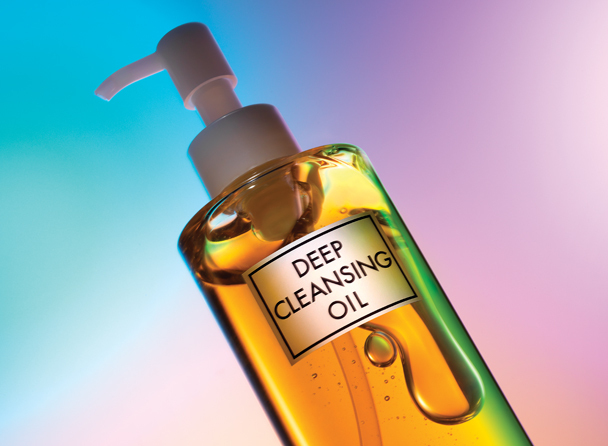 The star product – and the one that you’ve probably heard about most – is the DHC Deep Cleansing Oil. Crafted from a blend of rosemary leaf and olive leaf oils, the water-soluble formula presents the best of both worlds, offering all of the heavy duty makeup removal of an oil with the emulsive properties of a traditional cleanser. Entirely suitable for all skin types, it’s beloved for its ability to melt makeup and impurities away without leaving an oily film behind. The versatile oil is great alone or as the first step in your double-cleanse routine; simply massage it all over your face after a long day to stimulate blood flow and loosen the day’s debris, and rinse away for soft, radiant and smooth skin. It’s not surprising that DHC really nail the skin-perfecting aspect of their skincare and makeup products given that they hail from Japan, the home of satiny skin. The Velvet Skin Coat primer is a worldwide bestseller and a makeup artist essential, optimised to smooth and soften the look of your skin before makeup with its delicate powdery-gel formula. The multipurpose primer glides over skin with ease, immediately minimising imperfections while temporarily filling in fine lines and pores for a more flawless look. The resulting silky layer works to hold everything that you put on top of it in place while inhibiting excess oiliness from the skin, ensuring your foundation lasts much longer. My favourite product from DHC, and definitely something of a hidden gem, is the Mascara Perfect Pro Double Protection. I can edit my relationship with mascaras into a story as short, sparse and disappointing as my lashes; either they lengthen and don’t thicken, or they lengthen and thicken but don’t curl, or they do all of the above but end up making my eyelashes brittle. Not so with this workhorse formula. Upon first glance it’s quite unassuming, with its small wand and wet finish. The results are spectacular, though; offering long, curvaceous, lightly volumised lashes with impressive definition. And the best part is that the mascara has a tubing effect, which means it can be removed with a little warm water some gentle pressure, with not a makeup remover in sight. Being at the heart of East Asia’s skincare innovation, high performance technology is another thing that DHC does incredibly well. One of their latest releases taps into a trend that’s starting to make waves in the UK: the mini mask, strips of gel or fabric soaked in high tech ingredients to deliver a potent boost to localised areas of the face. The Revitalizing Moisture Strips for the mouth do just that, working to intensely firm, smooth and lift the skin around the mouth to ensure the area stays looking youthful and fresh, while added alpha-arbutin, mulberry and peony brighten the skin to diminish darker patches. Simply apply the strips to the skin, leave for 20-30 minutes, and then gently peel them away. They’re a pre-party essential. DHC makes even humdrum beauty essentials more appealing. Everything is ultra-functional, with clever design quirks and premium materials, all with a twist of Japanese kitsch. In light of the frequent battles I have with my old enemy midday shine, my most indispensable product of the bunch is the Oil Blotting Paper booklet. The slim paper booklet is finished in a sweet pink damask print, and inside you’ll find 100 sheets of natural hemp fiber papers, which absorb excess oil like nobody’s business. Tuck it into your desk drawer for ultra discreet touch-ups. This entry was posted on Thursday, September 25th, 2014 at 9:00 am and is filed under Make-up, Skincare. You can follow any responses to this entry through the RSS 2.0 feed. You can skip to the end and leave a response. Pinging is currently not allowed. I love DHC products, the primer being one of the best I have ever used. Great to see them stocked at Escentual.